Promote the products that each of your subscribers is most likely to purchase with SmartrMail's automated product recommendation emails. Each email contains personalized product recommendations based on each subscriber's past purchase history, browsing behaviour, and email clicks. We collect all the data and choose the products so you can do less and sell more. To learn how to automate Product Recommendation Emails with SmartrMail, watch the video below or read the instructions beneath it. This article will outline each task that must be completed to automate product recommendation emails. Add a Text Block, an Image block or a Custom HTML block (optional). They will appear at the top of your email, right after your header. 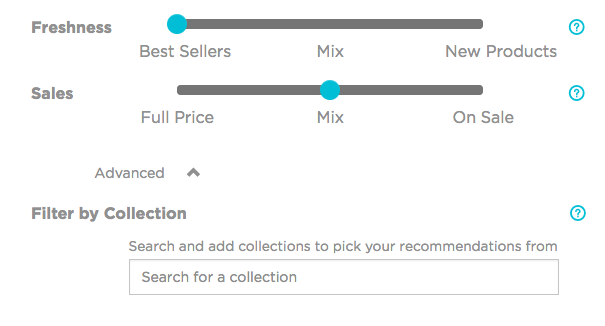 In the Content Mix tab, move to sliders to favour products based on Freshness and Sales. You can also set the app to choose products from specific collections using the "Advanced" button. *Sliders are hidden on Best Seller, New Arrivals, and Slow Moving Inventory engines. Here you can also a maximum height for your product images to keep a uniform look and remove product descriptions.